Jerry ponders some things that could have been different, and a lot less tragic. 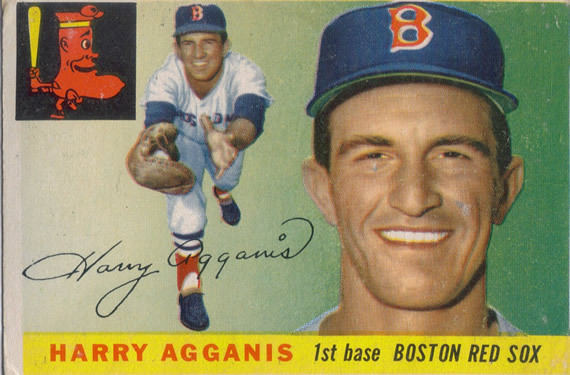 Harry Agganis, often referred to as “The Golden Greek”, like Tony C., was a hometown hero living the dream, when he was cut down at the age of 26, by a massive pulmonary embolism ( blood clots in the arteries to his lungs) while being hospitalized for pneumonia, in June, 1955. The 6’2″, 200 pounder was a three sport standout at Lynn Classical, who received 75 college scholarship offers before deciding to stay close to home and attend Boston University. A left handed quarterback, he was impressive enough that Paul Brown drafted him in the first round of the 1952 draft for his Cleveland Browns. Red Sox owner Tom Yawkey out bid Brown, and Agganis joined the Red Sox in 1954 as a first baseman. In the middle of all this, Agganis did a 15 month tour of duty in Korea as a US Marine. What could have been for Harry and the Red Sox? While Harry Agganis died before getting a full chance to show how good a major leaguer he may have been, Tony Conigiliaro was well on his way to greatness when a Jack Hamilton fastball caught him his left eye and cheekbone, ending his ’67 season and eventually, his career. 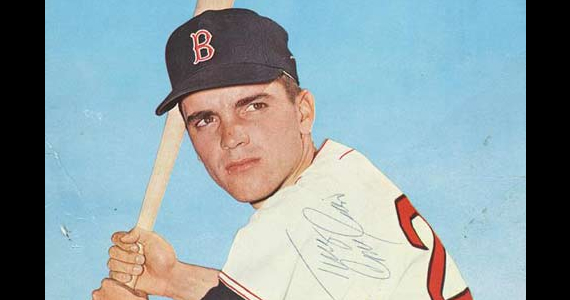 The Revere born Conigiliaro was just barely 19 when he debuted for the Sox in 1964, hitting the very first pitch he saw as a major leaguer for a home run. He went on to hit 23 more home runs that season, and set a record the following season when he hit 32 homers, becoming the youngest man to lead the league in round-trippers. Although he had productive years in 1969, when he was Comeback Player of the Year (26 HRS, 82 RBIs) and 1970 (36 Hrs, 116 RBIs), his eyesight had suffered permanent damage and he was soon out of baseball. Interestingly enough, although the helmet with the ear flap existed before Conigiliaro’s beaning, it wasn’t until 1971 that it became mandatory. One has to believe that it might have offered enough protection that it might have saved his eyesight. Tony C. suffered a massive heart attack in January, 1982, from which he never recovered. He died in February, 1990, at the age of 45. It certainly staggers the mind of this old time Celtics fan to think that Boston could have had Len Bias and Reggie Lewis, playing along side the “Big Three” of Larry Bird, Kevin McHale, and Robert Parrish. The C’s had given up guard Gerald Henderson to Seattle for what turned out to be the second overall pick in 1986 draft. With the 6’8″, Bias, they were adding someone to a Championship team, who experts such as Bill Simmons, felt had the athleticism of a young Michael Jordan. Bias died from an overdose of cocaine just a few days after being drafted. The family suffered even greater pain when his brother, Jay, was shot an killed in 1990, at the age of 20. 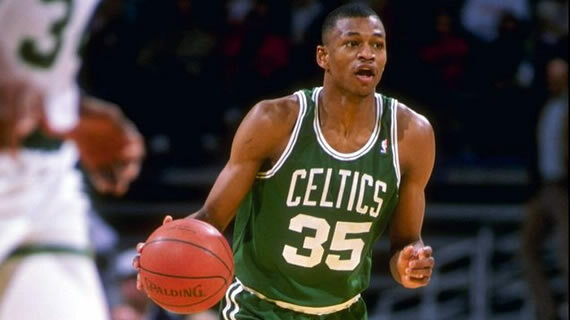 The loss of Reggie Lewis at the age of 27 in 1993 (after averaging just under 18 points in six seasons) had a substantial emotional impact on the city of Boston. Although he had grown up in Baltimore, he had played his college ball in Boston at Northeastern, a full four years back in that day, so in many ways he was looked upon as a local kid making good. Although there was a great deal of controversy over the cause of death of Reggie Lewis, in addition to the care he was given, and whether or not he was ever going to play again; hypertrophic cardiomyopathy (a defect of the heart, and a common killer of young athletes) is usually accepted as what took his life. His memory lives on in the Reggie Lewis Track and Athletic Center in Roxbury. There have been other young athletes in Boston whose careers and lives have been impacted by injury and illness. Normand Leveille was a young winger for the Bruins, 14th overall pick in 1981, who suffered an aneurysm at 19 ending his career. The Patriots’ former first rounder Darryl Stingley was in his fifth year when paralyzed by a helmet to helmet hit in 1978. Finally, Red Sox top pick, Ryan Westmoreland, recently had to retire at 22, after two brain surgeries to correct a situation unrelated to baseball. All these stories, as difficult as they are, are not intended to suggest that teams should mortgage their futures, and the futures of their young players, by pursuing a win-at-all-costs approach. Rather, I’m saying that an organization should never squander an opportunity on the assumption that it’s going to be there again next year. Just ask Dan Marino, who went to (and lost) a Super Bowl in his second year as a pro. He played for fifteen more seasons and never went to another one. Now look at the Nationals, who are playing .500 ball and have Strasburg’s on the DL. Only time will tell whether or not they played it smart or they are the baseball version of Marino and the Dolphins.